Set includes the following: (1) 16" x 22" 100% cotton tri-folded embroidered towel with scrubber pattern, swivel clip for easy bag attachment and team logo embroidery; (2) 2 regulation golf balls with full color team logo durable imprint; and (3) league specific divot tool and removable double sided enamel color fill magnetic marker, all housed in sleek tin packaging. 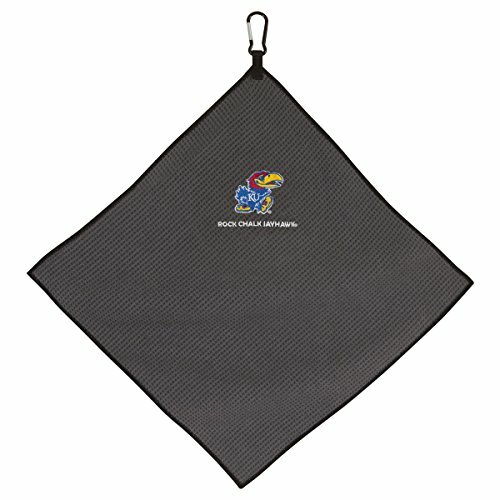 Show off your University of Kansas pride with this embroidered 16 in x 25 in trifold golf towel. 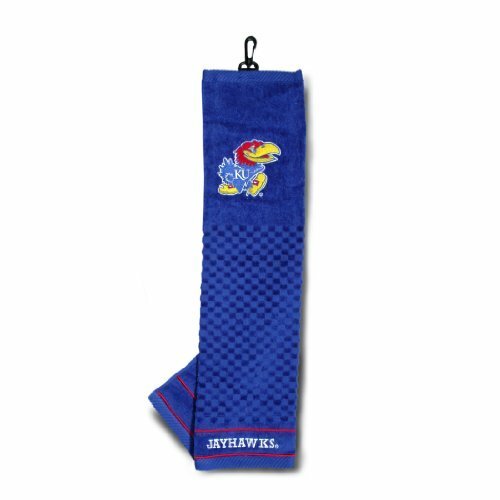 This KU towel features a hook and grommet for easy attachment to your golf bag. Show your team spirit for the Jayhawks every time you go to the golf course! 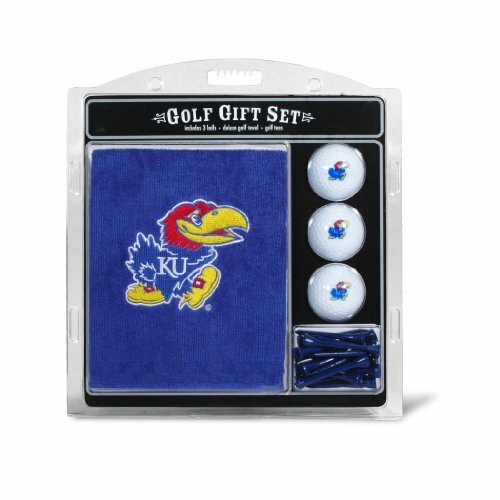 This University of Kansas Embroidered Towel Set is the perfect gift for any KU Golfer! 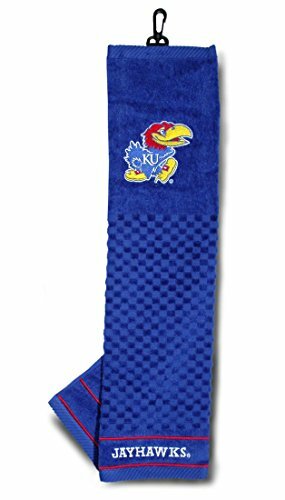 The unique Kansas Jayhawks gift set includes one 16 in x 26 in embroidered tri-fold golf towel with hook and grommet, three golf balls and twelve tees. 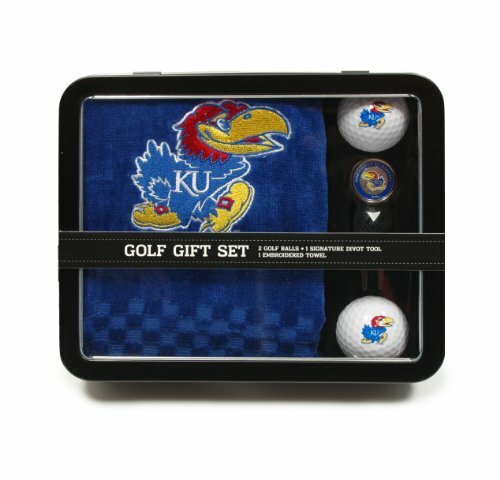 Take the Jayhawks to the course with you every time you go! 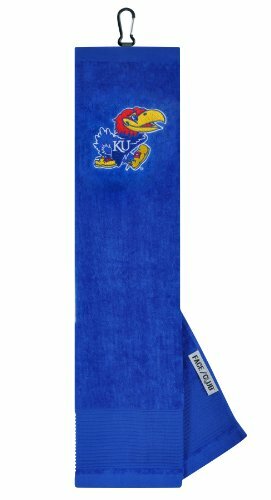 637556217103 NCAA Team: Kansas Features: -Towel. -Official NCAA teams color and logo. -Full color logo and bottom embroidered team name. Generic Dimensions: -Overall dimensions: 6" H x 22" W x 0.75" D. Dimensions: Overall Height - Top to Bottom: -6 Inches. Overall Width - Side to Side: -22 Inches. Overall Depth - Front to Back: -0.75 Inches. Overall Product Weight: -0.37 Pounds.